Slabside becomes even more dangerous after a guard is murdered and everyone is a suspect. Felicity (Emily Bett Rickards) enlists help from a surprising source in her pursuit of Diaz (Kirk Acevedo), and Laurel (Katie Cassidy) flexes her muscles as the District Attorney. Kristin Windell directed the episode written by Sarah Tarkhoff & Tonya Kong. Air Date: Monday, Nov. 19 (8:00-9:00 p.m.) on the CW. 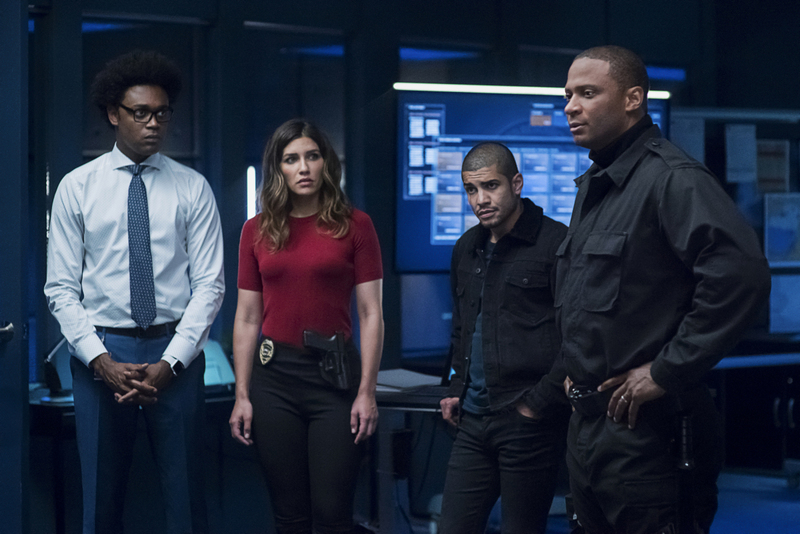 Arrow -- "Due Process" -- Image Number: AR706a_0177b -- Pictured (L-R): Echo Kellum as Curtis Holt, Juliana Harkavy as Dinah Drake/Black Canary, Rick Gonzalez as Rene Ramirez/Wild Dog and David Ramsey as John Diggle/Spartan -- Photo: Dean Buscher/The CW -- ÃÂ© 2018 The CW Network, LLC. All Rights Reserved.